forsaw the coming of god? its a self portrait! Wow! If only there was a site that you could upload pictures of things that looked alike. 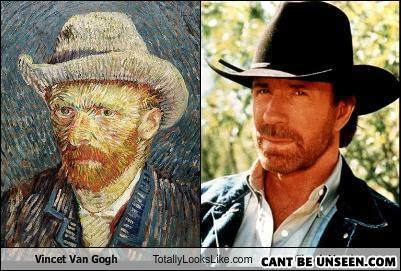 vincent van gogh = chuck norris? chuck norris can win a staring contest with 2 fingers in his nose and both eyes closed! no, it says that chuck norris is much older than he is saying!! goddamn, he's a fooking genius! At night, monsters check to see if chuck norris is under their beds. What do a priest, a rabbi, and an asian have in common? They all don't know each other.